The first coin issued in 2013 for the US Mint’s America the Beautiful Quarters® Program was the White Mountain National Forest Quarter honoring the forest in New Hampshire. It is the sixteenth quarter overall in the series that began in 2010 and it was released on January 28, 2013. For a limited time, the U.S. Mint offers rolls and bags of the coins in circulating qualities from Denver, Philadelphia and San Francisco. It also offers proof and uncirculated qualities collectors enjoy. These latter offerings come within several U.S. Mint products that have release dates spread throughout 2013. Several quarter design candidates were reviewed by the Citizen’s Coinage Advisory Committee and the United States Commission of Fine Arts. Having reviewed the recommendations from the CCAC and CFA and consulted with at least the Secretary of the Interior, U.S. Treasury Secretary Geithner selected the final reverse design for the White Mountain National Forest Quarter. That design, created by Phebe Hemphill and is shown in the quarter image above, features Mt. Chocorua. It is the easternmost peak of the Sandwich Range. The view is framed by birch trees. 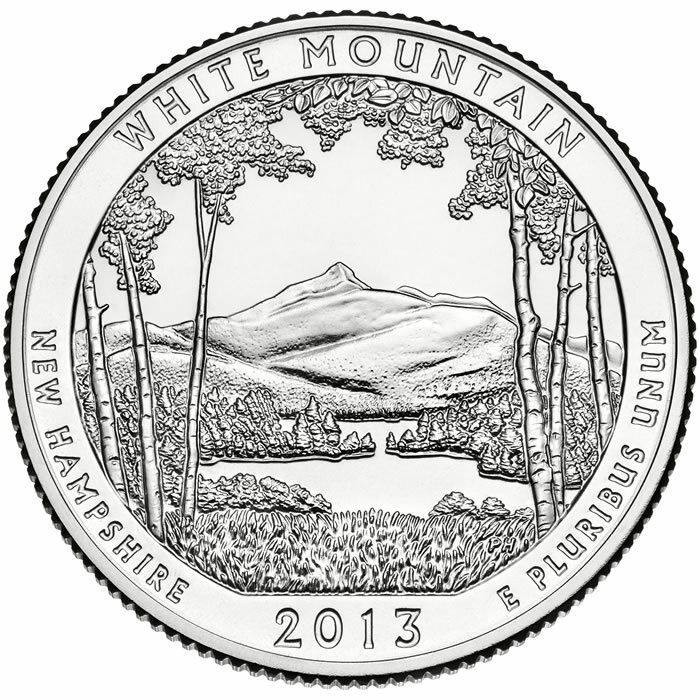 Inscriptions are WHITE MOUNTAIN, NEW HAMPSHIRE, 2013 and E PLURIBUS UNUM. The reverse design is joined by a common obverse of George Washington as dictated by the program’s authorizing legislation. The image of the first President of the United States is included on all of the America the Beautiful Quarters and was designed by John Flanagan. Following the White Mountain National Forest Quarter are the four other 2013-dated coins, including the Ohio Perry Victory and International Peace Memorial Quarter (April 1, 2013), the Nevada Great Basin National Park Quarter (June 10, 2013), the Maryland Fort McHenry National Monument and Historic Shrine Quarter (August 26, 2013) and the South Dakota Mount Rushmore National Memorial Quarter (November 4, 2013). Richard Peterson, Acting Director of the U.S. Mint and Governor Hassan at today's White Mountain National Forest quarter ceremony at Plymouth State University in New Hampshire.